A couple of dreams: The deal was that if you wanted to buy a sausage, you also had to get four eggplants. I bought four sausages, which meant sixteen eggplants. So I spent the dream thinking about ways to use the eggplant: ratatouille? In the other one, some youngster was talking about how cool my stubble was, and complaining that he couldn't grow it himself, and it wasn't available in stores. I explained to him that the stubble wasn't to be cool, just that I was too lazy to shave. One of the lights is burnt out at the studio, so I had the shades up for some natural light. Along comes a squirrelly squirrel, who eyeballed me for awhile. Mary Ellen and Jim Dandy tied on today's cover contest, with two of four. "The SS Edmund Fitzgerald was an American Great Lakes freighter that sank in a Lake Superior storm on November 10, 1975, with the loss of the entire crew of 29. When launched on June 8, 1958, she was the largest ship on North America's Great Lakes, and she remains the largest to have sunk there. Nicknamed the "Mighty Fitz", "Fitz", or "Big Fitz", the ship suffered a series of mishaps during her launch: it took three attempts to break the champagne bottle used to christen her, and she collided with a pier when she entered the water. For seventeen years the Fitzgerald carried taconite iron ore from mines near Duluth, Minnesota, to iron works in Detroit, Toledo, and other Great Lakes ports. As a "workhorse" she set seasonal haul records six times, often beating her own previous record. Her size, record-breaking performance, and "DJ captain" endeared the Fitzgerald to boat watchers. Captain Peter Pulcer was known for piping music day or night over the ship's intercom system while passing through the St. Clair and Detroit Rivers (between Lakes Huron and Erie), and entertaining spectators at the Soo Locks (between Lakes Superior and Huron) with a running commentary about the Fitzgerald. 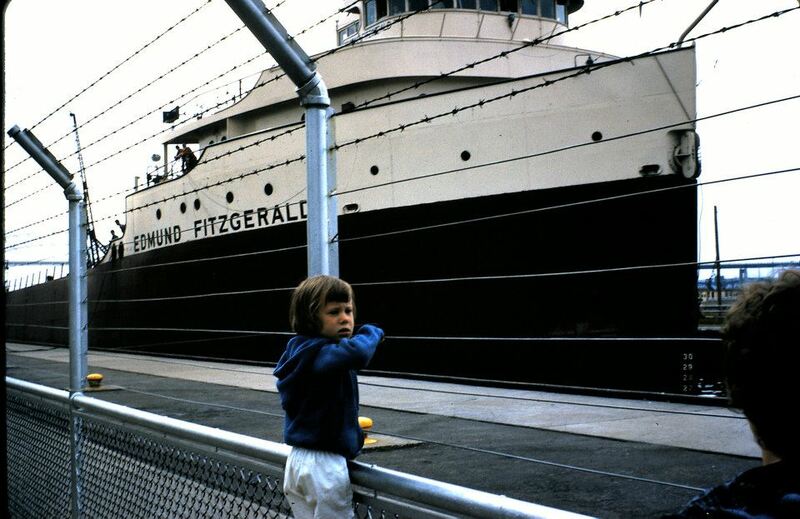 Carrying a full cargo of ore pellets with Captain Ernest M. McSorley in command, the Edmund Fitzgerald embarked on her final voyage from Superior, Wisconsin (near Duluth), on the afternoon of November 9, 1975. En route to a steel mill near Detroit, Michigan, she joined a second freighter, the SS Arthur M. Anderson. By the next day the two ships were caught in the midst of a severe winter storm on Lake Superior, with near hurricane-force winds and waves up to 35 feet (11 m) high. Shortly after 7:10 p.m. the Fitzgerald suddenly sank in Canadian waters 530 feet (160 m) deep, approximately 17 miles (15 nautical miles; 27 kilometers) from the entrance to Whitefish Bay near the twin cities of Sault Ste. Marie, Michigan, and Sault Ste. Marie, Ontario. Although the Fitzgerald had reported being in difficulty earlier, no distress signals were sent before she sank. Her crew of 29 all perished, and no bodies were recovered. Many theories, books, studies and expeditions have examined the cause of the sinking. The Fitzgerald may have fallen victim to the high waves of the storm, suffered structural failure, been swamped with water entering through her cargo hatches or deck, experienced topside damage, or shoaled in a shallow part of Lake Superior. The sinking of the Edmund Fitzgerald is one of the best-known disasters in the history of Great Lakes shipping. Gordon Lightfoot made it the subject of his 1976 hit song "The Wreck of the Edmund Fitzgerald." 2. A group called CCS covered a tune, the question is, what's the title, and who is it by? Answer: Led Zeppelin, "Whole Lotta Love." 3. A cover of Joni Mitchell's "Help Me." Question: who is doing the cover. Answer: k.d. lang. 4. Same structure as #2. Answer: Led Zeppelin, "The Crunge." 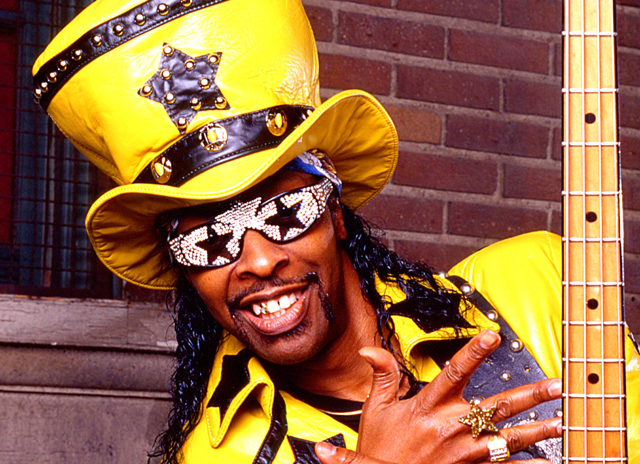 BONUS QUESTION: Who do Proud Righteous Teachers sample in "Rock dis Funky Joint"? Answer: War, "Slippin' into Darkness." Jim was having what IT people call "connectivity issues," meaning that the internet stream kept rebuffering on him, making him miss big chunks of the show. His entry to the contest was titled "Buffer the Radio Slayer." Better luck next week, pal! I brought in trunk full of funk for a second-hour set: James Brown, AWB, Zapp and Roger, Tower of Power, and Parliament. More fun than you could shake a stick at (Jim is going to shove that stick up the computer's USB port!). or more fun than a barrel of monkeys. Catamount Community Radio, Sunday mornings 10-12 (ET) on WWCU-FM. 24. The Kinks – Where Did my Spring Go?